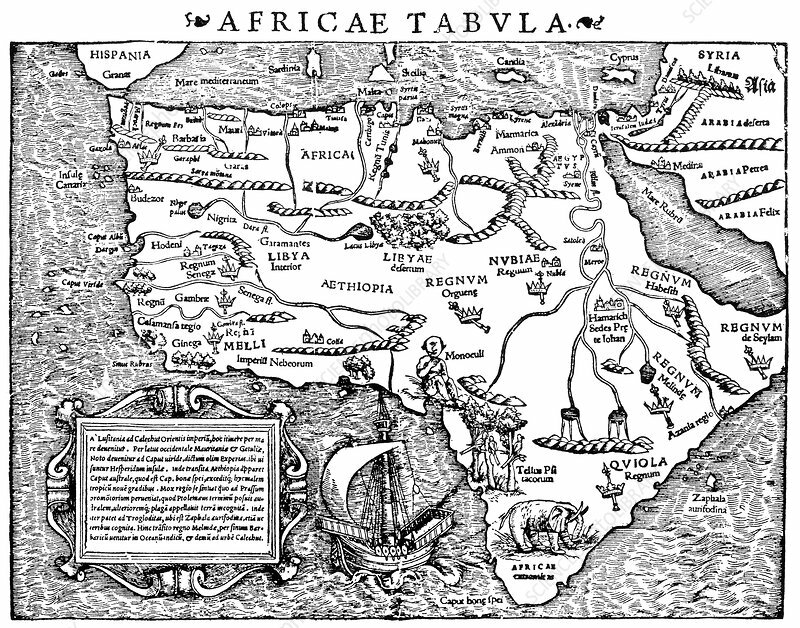 The earliest obtainable map of the whole continent of Africa. Because it was issued with some variations in both of Munster's very popular works, Geographia (1540-1552) and Cosmographia (1544-1628), the map is difficult to date precisely. Sebastian Munster (January 20, 1488, May 26, 1552) was a German cartographer, cosmographer, and a Christian Hebraist scholar. His work, the Cosmographia from 1544, was the earliest German description of the world. The Cosmographia was one of the most successful and popular works of the 16th century. It passed through 24 editions in 100 years. This success was due to the fascinating woodcuts (some by Hans Holbein the Younger, Urs Graf, Hans Rudolph Manuel Deutsch, and David Kandel), in addition to including the first to introduce separate maps for each of the four continents known then, America, Africa, Asia and Europe.